The new year begins with loads of delicious, invigorating color at Sanchez Art Center! 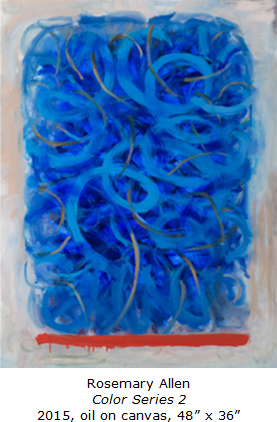 Painter Rosemary Allen will show paintings from her Color Series and Abstract Series in the Main Gallery, curated by Danna Hall. Rosemary Allen has been working as a professional artist for 46 years. She attended San Francisco Art Institute and earned a BFA with high distinction from California College of the Arts. Allen has had several one-woman shows in the Bay Area and northern California and has participated in numerous group shows, including the 2010 Bay Area Currents Show at the Pro Arts Gallery in downtown Oakland. Allen is fascinated with color and space relationships, and she creates depth and texture by, as she says, “building up and tearing away, creating and destroying.” Her paintings are richly imagined and generously realized, with an emphasis on not just color but the language of color, and how it can extend meaning into every moment of our lives, awakening and refreshing our deepest imaginative selves. This purity of art for art’s sake needs no further explanation or justification once one experiences it; we feel the significance and can enjoy our direct response to Allen’s work. Although she is best known for her abstract painting and use of color, she also paints the figure and landscapes. 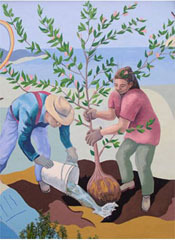 Her latest figurative works depict construction workers and gardeners in Oakland. To see images of these and other paintings, visit www.rosemaryallen.com. With studios in both Mendocino and Oakland, Allen is currently represented by Partners Gallery in Fort Bragg. Allen will give a free talk about her work on Sunday, February 21, at 4 pm. Sanchez Art Center is located at 1220 Linda Mar Boulevard in Pacifica, 1.5 miles east of Highway 1. Following opening night, the galleries are open Friday, Saturday, and Sunday, 1–5 pm, and by appointment, through February 21.